This is a rustic-modern retreat in the Alpine Meadows area near Lake Tahoe, California. The owner, Todd Greenhalgh, wanted solar power and alpine views and CCS Architecture delivered just that. 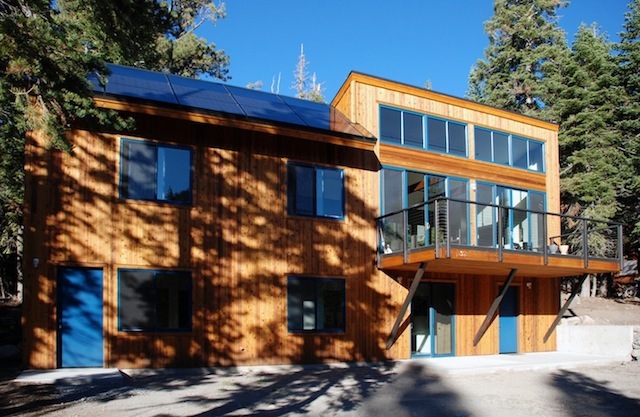 The south-facing roof has 600 square feet of solar and all the main rooms hug the south wall to hold a view of the surrounding Sierra Nevada mountains. I just recently learned of this contemporary retreat designed by CCS Architecture for an eight-person family. The 2,800 square-foot home sits on a picturesque, 20-acre site nestled about five miles inland from the beach town of Aptos, California. It's a vacation place, which some of you won't think is all that green, but the owners and design team worked to make the $1.8 million project a low-impact one.